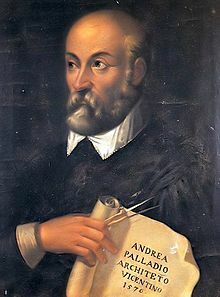 Andrea Palladio (Italian pronunciation: [anˈdrɛːa palˈlaːdjo]; 30 November 1508 – 19 August 1580) wis an Italian airchitect active in the Republic o Venice. 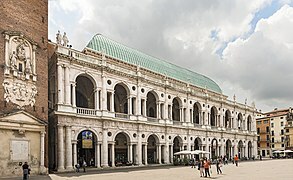 Palladio, influenced bi Roman an Greek airchitectur, primarily bi Vitruvius, is widely conseedert tae be the maist influential indiveedual in the history o airchitectur. Aw o his biggins are locatit in whit wis the Venetian Republic, but his teachins, summarised in the airchitectural treatise, The Fower Beuks o Airchitectur, gained him wide recogneetion. The ceety o Vicenza an the Palladian Villas o the Veneto are UNESCO Warld Heritage Steids. ↑ 1.0 1.1 "Andrea Palladio (Italian architect) – Britannica Online Encyclopedia". Britannica.com. Retrieved 25 March 2013. This page wis last eeditit on 27 August 2017, at 08:14.